When you are first starting out with Japanese, it’s fine to just learn new words individually. But once you’ve gotten a feel for the language, you really want to practice Japanese sentences as a whole so that you can learn new vocabulary and gain a working understanding of the grammar of the language. The problem that most people have is finding a good source of Japanese sentences to learn! You could use a textbook, but the example sentences are usually minimal. You could use a dictionary, but it tends to be a little stiff and boring. Luckily there are some fantastic resources out there, and I happened to stumble upon one the other day that is great for beginners, and even better for intermediate learners of Japanese! 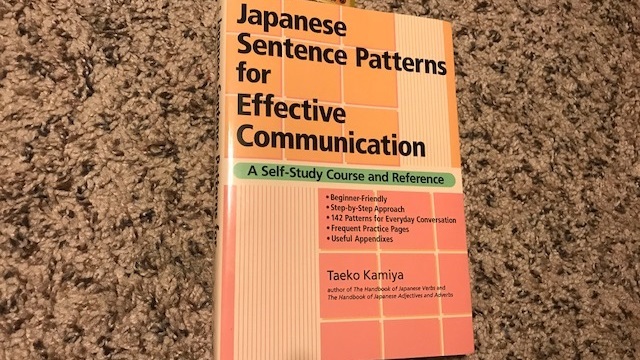 Japanese Sentence Patterns for Effective Communication: A Self-Study Course and Reference by Taeko Kamiya. It’s a really simple concept, and one that is incredible effective for learning and remembering Japanese, but almost no one in the education system talks about. It’s based on the concept that “language is nothing more than a series of patterns for communicating.” If you can recognize these reoccurring patterns, even when certain words within them are different, then you can understand what’s being said and then use those same patterns yourself to communicate back. kore wa watashi no jisho desu. Super simple, right? But with this one pattern you can declare every single thing that you own! All you have to do is swap out the word ​辞書 (dictionary) with anything else (girlfriend, cellphone, little brother, etc.). You could also change the word “my” to “your, his, her, etc” to further increase the number of sentences you can use and understand. One pattern = dozens of useful sentences. What happens when you know 2 patterns? How about 10? How about 100? 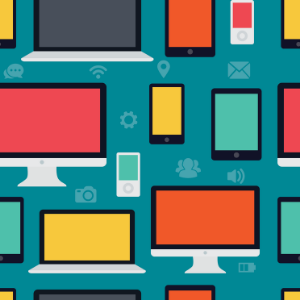 Are you starting to see how powerful this kind of pattern recognition is? kono jisho wa watashi no desu. The meaning is basically the same, it’s just organized a little differently to highlight a different emphasis. kono pai to sono pai to, dochira ga amai desu ka? Which pie is sweeter, this pie or that pie? Now you have a pattern that allows you to ask about comparisons. Switch out the word “pie” to talk about different nouns. Switch out the word “sweet” to talk about different adjectives. It’s still the same pattern as before! Are you excited yet? Click Here To See Why So Many Other People Love this Book Too! The book teaches you a total of 142 patterns. Granted, some patterns have sub-patterns within them (like we saw before) that are similar enough to another pattern so they don’t get classified as their own. Basically what I’m saying is that you are actually going to learn more than 142 patterns, it’s just that some of them are really only slight variations. The beginning of the book has all 142 patterns organized with the patterns in English listed on the left page and each of their corresponding Japanese patterns on the right page. Then at the end of all the patterns it goes into chapters where the author dives into each of the patterns one by one, and explains the grammar associated with each, and anything else that you would need to know in order to gain a full understanding of the sentence. This is great since the focus is on learning Japanese, and you only learn what grammar you need to at that point in time. It prevents confusion and overload that are common problems when you learn straight from grammar books. Then there are some example sentences and new vocabulary that you look over before doing a short, but useful quiz at the end of the chapter. I think that this quiz part is really insightful since studies have shown that people learn better when they are immediately tested on something, right after they just learned it. What’s even better is that fact that the author asks “how would you say this phrases in Japanese?” and then gives you the English version. This forces you to use anticipation and recall to provide the correct answers, which are way more effective method for solidifying information into your long-term memory as compared to other methods such as multiple choice. Even though this type of testing is more difficult than the typical “choose the correct answer out of these options,” I feel it’s better to do the hard (but necessary) work now so that you get better results faster and can then move on to learn more things. Even though this book is fantastic, it still has (potentially) two drawbacks to it. The first one is that there is no audio CD with it. It would have been really nice to have recordings of native speakers saying each pattern so that you could get a feel for the rhythm and flow of each sentence as a whole. The book uses Rōmaji to show the pronunciation of each word along with kanji/kana , but I don’t really like using Rōmaji all that much since it tends to allow people to use American (or English) accents to say Japanese words. Perhaps the best way to overcome this would be to know Hiragana and Katakana down flat, and then to work on memorizing the correct reading of each kanji as you encounter them. Then you could go over each example sentence in the book and just cover up the Rōmaji with something so that it doesn’t get in the way. The second drawback only exists with digital copies of the book, so if you have a physical copy, then you don’t need to worry about it. But when you read it on a digital platform, you only see one page at a time. That means that you are going to see 10 or so English phrases, and then you’re going to have to remember them when you scroll down a page and see the 10 corresponding phrases in Japanese. If you don’t remember them exactly, you gotta’ scroll back up, re-memorize them, and then scroll back down to practice the Japanese version again. The physical book doesn’t have this problem since you can easily look at one line on the left page (English) and then move your eyes to the right page to see the matching Japanese phrase. The solution to this problem is to get the paperback version if you can. If not, just be aware that you’ll have to do a little extra work with the eBook format. Since I recommend you get a physical copy of the book, I think Amazon is the best place to purchase it. Click Here to See it on Amazon Now! Honestly I’m surprised that more people aren’t talking about this book. It’s like a super-phrasebook for Japanese, but the information is used for everyday life instead of primarily tourist topics. Like most (good) courses and books on Japanese, this one will produce good results, as long as you do the work. 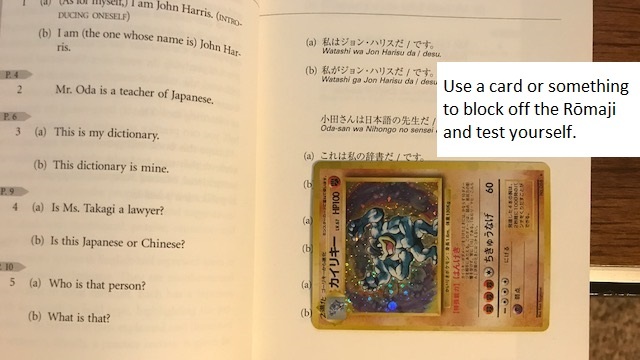 I wouldn’t say this is the “most fun” way to learn Japanese, but it’s certainly not boring by any means. Buy it for the results, and then use your new skills to enjoy Japanese manga or something like that. Anyway, those are my thoughts on it. What about you? Have you used this book before? Do you have any other questions about it? I have been wanting to learn other languages for some time now. But I have been stuck on rather to invest in a program like Rosetta Stone or a booklet like you are talking about in this post. Could you point me in the right direction and which would you prefer for a beginner trying to learn a new language. Hey James, the first thing you want to do is decide on exactly which language you feel you would enjoy learning the most. I think it’s better to pick out a language that you like, rather than one that might be “useful” for things like work. After that, if you are brand new to a language, then you really want to spend some time learning the native sounds of that language. The Pimsluer Beginner Course does exactly that, and is really cheap since it’s just the first 10-15 lessons out of their total of like 120 or so. In addition to the Pimsluer beginner course, I would recommend picking up a good phrasebook as it will show you what the written language looks like, and give you some useful phrases for people new to the language. Your total investment for getting those two things might be a total of $20 or so depending on where you get them. If you want to learn more about Pimsluer and how they teach, then you can do so here. If you want to know what to look for when picking out a good phrasebook, then this will tell you. So to answer your question, I think you should get both a book and a course, but if your not already set on a particular language, then the two above resources are a great way to get started on a very low budget. Once you’ve found a language and committed to reaching fluency in it, then it would be a good time to invest in some bigger things. The book on Japanese sentence patterns in this post is (in my personal opinion) a LIFESAVER for people who are series about learning Japanese! But if you’re not going to learn Japanese, then there’s no reason to get it. Thanks!